Today I'll be sharing some things that I'm currently up to....enjoy! listening... to new albums from Sia, Charlie Puth, and Wet. So many great songs for listening during work! eating...Whole30 for the final day! That's right- I made it to day 30. As for day 31 and beyond, I'm not planning on changing my habits right away. I'm enjoying the food I'm eating, feeling great, and not feeling deprived at all. I'm going to treat myself to a glass of wine tomorrow evening, but otherwise I'm good to go! dreaming... about the future. I probably sound like a broken record by this point, but this is going to be a huge year for me! My wedding is only 88 days away, we're house hunting, and there are other big and exciting changes coming this year. It's a waiting game at this point for everything, so lots of day dreaming going on. smelling... Tocca perfume. I got this variety pack last year, and I love trying out the different scents. Right now my favorites are Simone and Stella! That's great to hear about the Whole 30. It sounds like you changed it into a lifestyle. Congrats Gretchen! Great job on Whole 30! I bet it was a great kick off for your budget plans as well, with all the practice of cooking at home. Thanks! And me too..although these 50 degree temps lately are nice! 88 days to your wedding!! Wow !! that's so cool!! Listening - Grease live! I have found Grease again and I'm loving it! Eating - I've started having spinach salads for lunch again... my body needs all the spinach I can get my hands on to start race season! smelling- My awesome Clinique Happy perfume! hearting- Enrique Bunbury's MTV Unplugged! Can't wait to see him in concert! I just watched Grease Live...SO good! I have the biggest girl crush on Julianne Hough..she is PERFECT! I can't wait to continue following along as you progress in this super exciting year! Dreaming - well I was dreaming about a snow day and we got one today! I love straightfoward posts like this! Just a fun quick glimpse at what's going on with you. Congrats on making it through whole 30 but definitely enjoy your wine tomorrow night!! Thank you!! I'm counting down the hours until it's acceptable to drink haha! Yay for Whole30! You're awesome. I'm drooling over all of the awesome spring and summer clothes that are starting to pop up, but I'm over here with about 20 pounds of baby on me so I mean, there's that.. Hahaha!! Baby beats new clothes any day! MMM coconut and vanilla sounds like it would be amazing! I love Sia's new album! It's so good and her voice is one of my favorites. Your wedding is so close! Ahh that's so exciting! Seriously SO good and unique! I currently heart both Oiselle pieces I got for my birthday. My sports bra arrived yesterday and it was almost like I wasn't wearing it. I can't wait to try it on my run this week. Ugh I'll have to try that out! Enjoy your glass of wine! Currently I'm hearting the spring weather that's arrived in Seattle. The blue skies and 40 degree temperatures make running amazing! It's been great here too so I hope it hangs around! i am currently eating potato chips. definitely not whole 30. oops. dreaming... of willpower so that i can stop eating potato chips. good job on the whole 30 and enjoy your glass of wine! those flats are GORGEOUS. and yay big year! Unfortunately I don't like the smell of gardenias, so I passed on that scent haha! That's why I love these variety packs..testing out different scents is fun! Thanks for linking up! No buy until June? WOW! 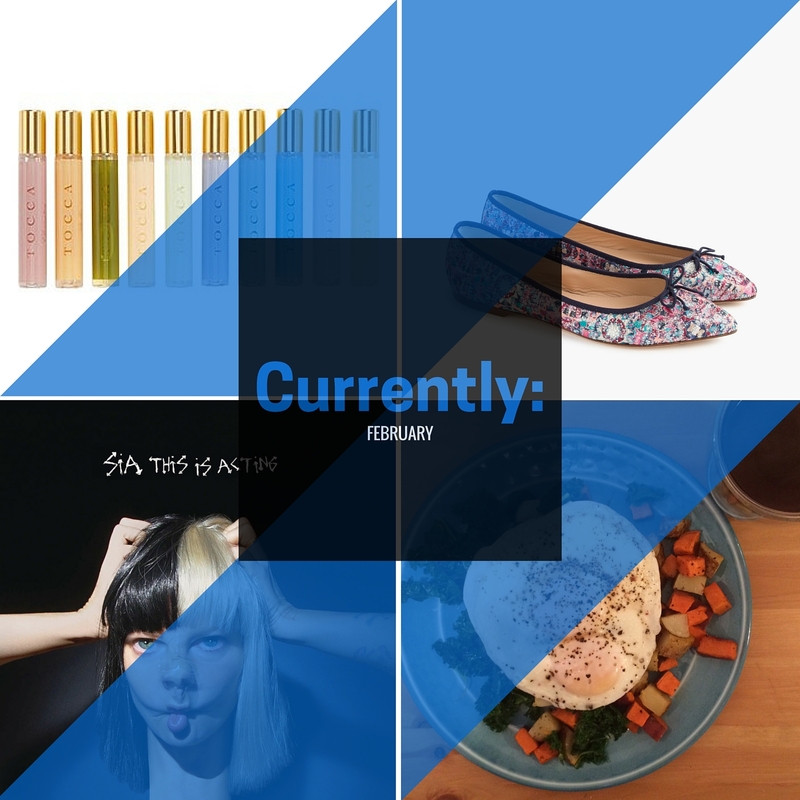 I had a no spend in January, which I'm really happy about because it was unintentional! But February brought 2 crashed computers and 2 birthdays, so March will definitely be no spend as well!